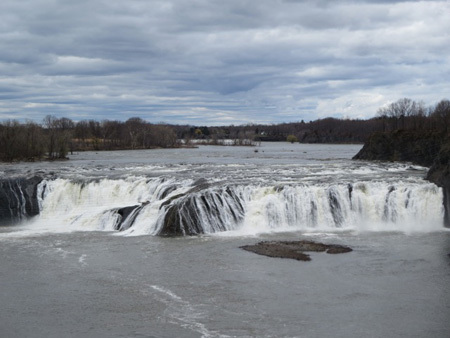 The last Sunday in April The Wife and I went to see Cohoes Falls, which I’d heard was running at full blast. Most of the time the falls are not there, just some interesting cliffs with a trickle of water here and there. But because of the long winter with a heavy snowpack we have a chance this spring to see the falls as they once were, as they ought to be. The Falls are about 90 feet at the highest point and about 1000 feet wide, not as big as Niagara Falls but impressive just the same. 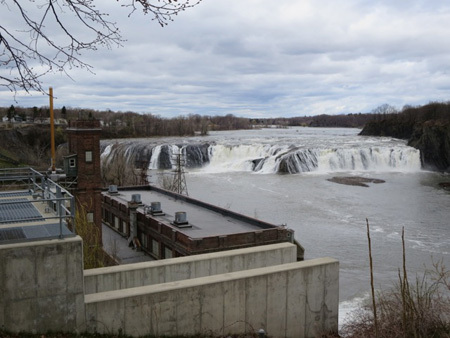 The falls stretch from behind Harmony Mills in the City of Cohoes over to the cliffs of the Town of Waterford on the other side of the Mohawk River. 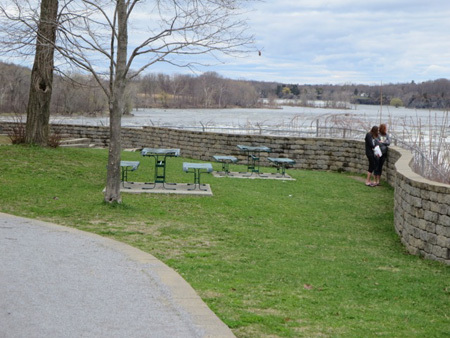 The best observation point is in Cohoes, that’s where we went to look. Historically, the beauty of the cascading falls has taken a back seat to the demands of navigation and industry. Back in 1831 the City of Cohoes built a dam behind the falls to divert water to power the nearby clothing and cotton mills. Later, in the 20th century, the mills closed and the diverted water was used instead for power generation. Further upstream some of that water that once went over the falls is diverted to fill the locks of the Barge Canal. Early settlers and explorers to this region travelled by river, after gazing in wonder at the marvelous falls they would then begin cursing as they hauled their boats and cargoes laboriously around the obstruction. Thus we have had canals to circumvent the falls since the early 1800s. Today it takes six locks of the current Barge Canal to traverse around the falls by boat. The Water Diverted From The Falls In The "Power Canal"
Thus it has been a long time since the water of Cohoes Falls fell free and unobstructed all year round. Most of the water that’s supposed to go over the falls goes to the waterway that snakes around the falls, which is now called the “power canal.” That water is no longer used to power the long-defunct mills, but for decades was not used at all as the power plant sat idle and rusting. For much of the second half of the 20th century, the power plant was owned by the then regional power monopoly, Niagara-Mohawk. 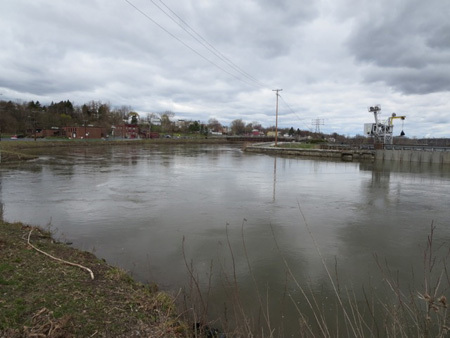 The Niagara-Mohawk Corporation was dedicated to shutting down their hydro-electric plants, and they didn’t care about the negative effects an idle power plant had on a small community like Cohoes. 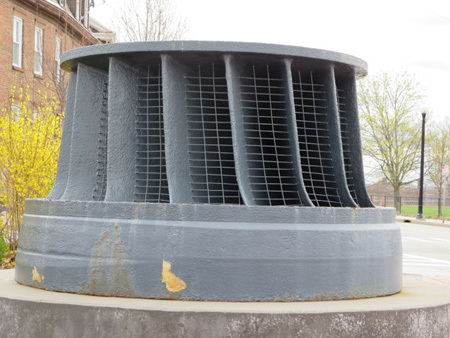 At one point Niagara-Mohawk even tried to fill the main building of the power plant with concrete, which would have prevented anybody from ever renovating or building a new power generating plant. There were good reasons why Niagara-Mohawk was eaten by a much bigger foreign corporation called National Grid, which did the sensible thing and let the power plant go. Throughout the first decade of this century there was then a series of court battles between the local Green Island Power Authority and the Brookfield Renewable Corporation of Quebec over who got to own and operate the plant. Naturally the US Court of Appeals sided with the bigger corporation, and now Brookfield has renovated the plant and in 2011 brought it back to life. Then mayor of Cohoes John McDonald (now State Assembly Member) hammered out an agreement with Brookfield to renovate the walking areas around the plant to be visitor friendly. This was to be part of Mr. McDonald’s push to turn the nearby empty hulking Harmony Mills buildings into apartments. The agreement was made back in 2006 when Brookfield was uncertain about their chances of winning the court battles, I’m happy to report that the corporation kept their promises. There’s a short walking trail that leads from the observation park to the back of Harmony Mills. On one side of the path is a chain-link fence so that visitors don’t go tumbling down the sheer cliff, on the other side is a series of backyards. 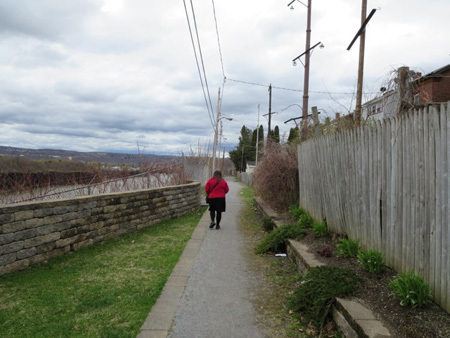 It’s very nice, but it would be nicer still if the City of Cohoes would occasionally pick up the trash that has accumulated at the last bend of the walk. We came out at the back of Harmony Mills. The backyard is now a parking lot with one story garages that made me think of old fashioned military bunkers for some reason. The newly renovated high-end apartments are quite popular with “young professionals” who commute elsewhere to work. 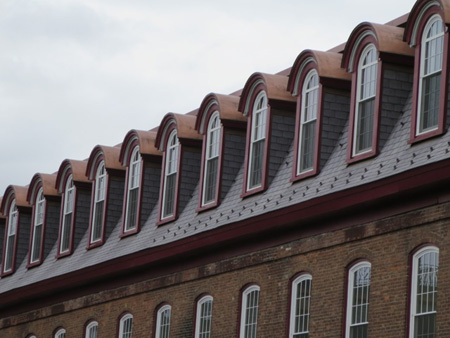 The successful renovation of the Harmony Mills buildings is the reason why this past decade Cohoes registered its first increase in population since the 1930s, which is when Harmony Mills closed, never to reopen. 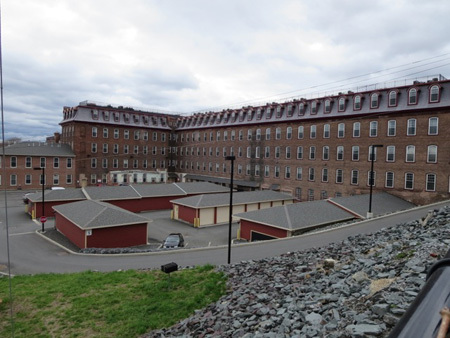 Harmony Mills and the nearby housing built for mill workers gives this part of Cohoes the feel of an English industrial town of past centuries. 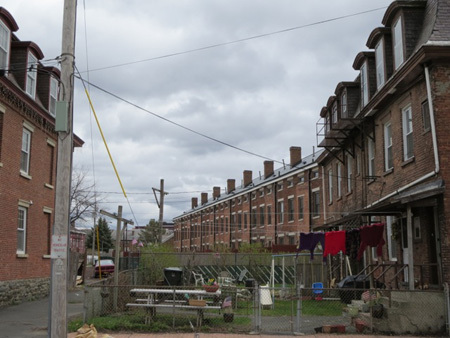 Of course, it looks like an old English industrial town but without the grinding poverty and the deadly coal dust and smoke clogging the air. Come to think of it, because the mills were powered by water there probably wasn’t much air pollution around here back in the day, just the poverty. For a century and a half upstate New York was a leading industrial region that maintained hundreds of manufacturing plants that used our abundant cascading waterways as a power source. Visitors can still look at the now closed water tunnels that provided water to the waterwheels that were located inside the mill buildings. From those waterwheels long leather belts that could be engaged when needed ran all the way up to the top floors of the buildings, these belts turned the shafts of the machines that were used for manufacturing. In the late 1800s Adirondack Park was created because of a political alliance between conservationists and leading mill owners. The owners of mills such as these, you see, came to understand that the water that powered their mills, which came from the mountains of the north, had to be protected and kept flowing or they would be out of business. The courts agreed that the needs of the mill owners was greater than the needs of tree cutters in the mountains, thus the largest State park in the country was created and designated “forever wild” so as to keep the mills running. There’s a walkway bridge across the power canal that looks like it was once a rail trestle. 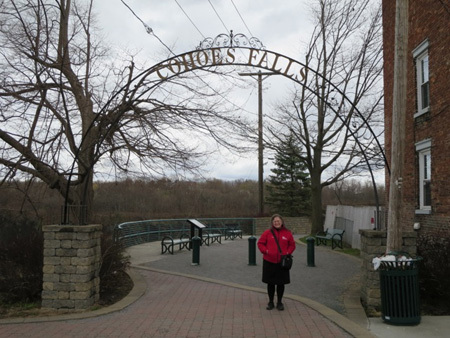 Unfortunately, despite all the visitors arriving after us to see Cohoes Falls while it is still running, the walkway was closed. A sign on it said it would be opened on May 5, which is the day the State canal system officially opens. Since no boats come down the power canal, does that make sense? I’m very glad to see the hydroelectric plant running again, and I’m glad it did not succumb to corporate plots to destroy it. It seems to me that our waterways are a resource that is underutilized, not just neglected for travel and shipping but also as a source of power that is mostly ignored. So I pose the question, could our waterways be used to once again to power manufacturing plants, a power source that is independent of the grid and does not burn fossil fuel? Why not bring back the industrial waterwheel? Thank you for this informative article, Dan. 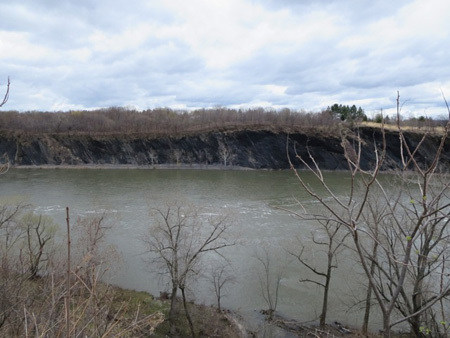 This is dated news but relevant to Cohoes Falls: Brookfield Hydroelectric returned the Cohoes Falls sacred site, the land overlooking the Falls to the Haudenosaunee by giving it to the Hiawatha Institute (without threat of litigation) in 2012. See link below. We should all celebrate good neighbors like that.